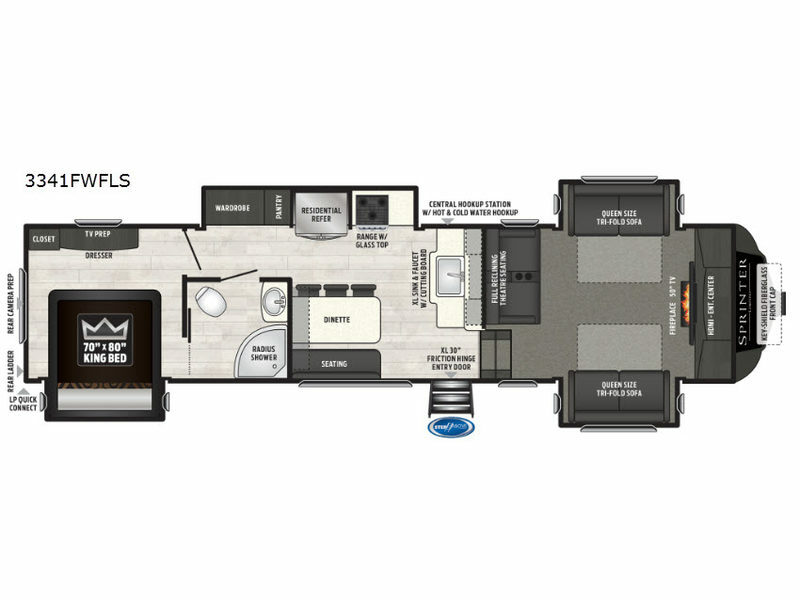 This fifth wheel could be your home away from home with a separate living area, quad slides throughout and a fireplace for those chilly nights. The front living area offers two opposing queen size tri-fold sofa slide outs, reclining theatre seats, and a 50" HDTV with a HDMI entertainment center. This area can also double as a sleeping space for the kids or grandkids. Just imagine the third slide out including the king bed, and the bathroom giving you two access points, plus there a wardrobe next to the pantry in the kitchen slide. The unique dinette offers bench and chair seating to play games and dine at. Your search can be over!